My blog and I have missed the schedule (albeit, a loose one) that TWD provided. It's busy around here (Baby Strawberry is potty training!) and while I haven't posted much my kitchen has been bustling! I had a baby shower for my girlfriend who is having her first girl (after three boys!) any day now. Pink was a priority and a valentine's theme made it easy (considering all of my serving dishes are red!) These treats are all pretty simple and have a big wow factor with the amazing flavors and little details. I've posted the red velvet cupcakes and mint brownies before- though I've never made the mint brownies pink, that was a new one! 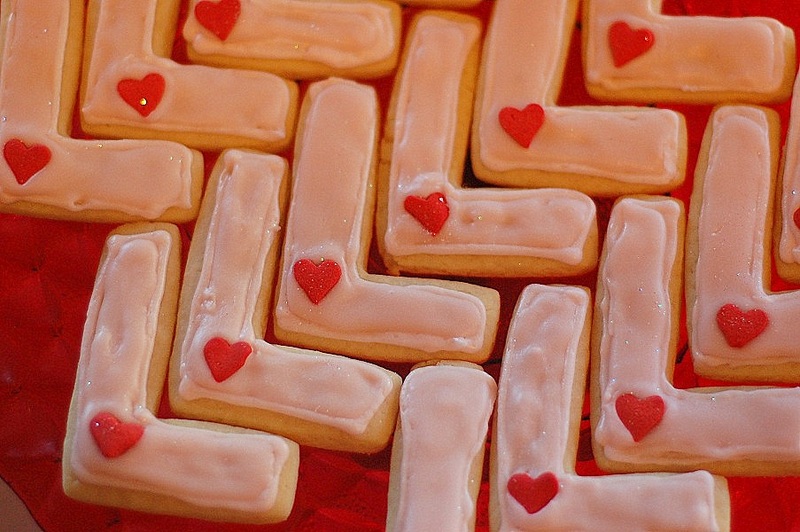 The cookies (L's in honor of the baby) are Natalie's signature recipe. I'm no decorator but I've improved with her tips. Natalie uses a Wilton Squeeze bottle to pipe the outsides of the cookies (like drawing, nothing to stressful) and then uses another with thinned icing to 'flood' or fill the middle. In-a-hurry-not-so-steady-hands-Anne doesn't do them justice but they were yummy and cute (especially with the edible glitter, I love that stuff!) 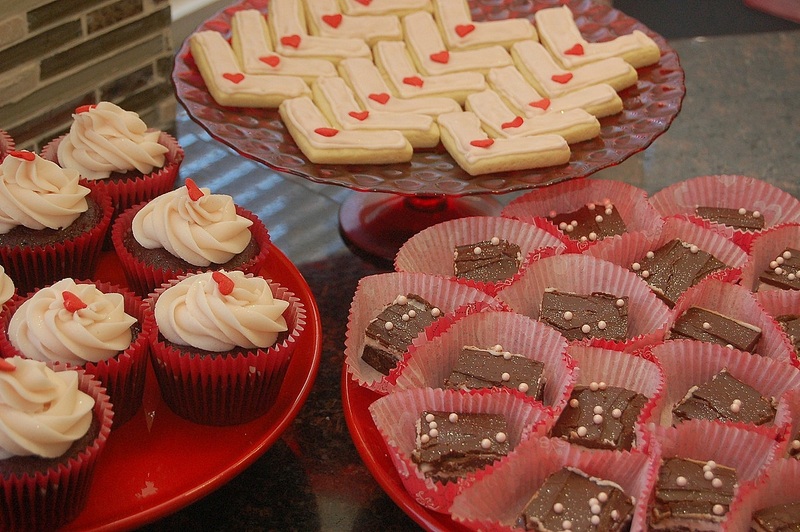 The best part about the cookies is you can bake off extras and freeze them to decorate and serve another time, all the end product without the stress. Natalie's recipe is pretty full proof- if I can do it- and you don't have fuss much with the dough. She doesn't chill hers, though I do normally, and they come out great every time. Sugar cookies take a lot more practice than cupcakes but the practice is enjoyable and delicious, worth the effort I think! Cream butter and sugar together. Add eggs, vanilla, and sour cream and beat. Add dry ingredients, being careful not to over mix. Reserve some flour for the counter and dump the almost mixed dough out and shape it as you would pie dough. Divide into two disks, chill for 15 minutes, then roll to ½ inch thickness and cut as desired. Bake at 400 for 8-12 minutes (depending on size of cookies). Blend butter and sugar. Stir in vanilla and milk- beat until smooth. Flavor and color as desired. Use plastic condiment bottles to pipe icing onto cookies (thin with milk or warm in microwave to flood centers). You have outdone yourself! Everything looks so lovely and delicious - you have a very lucky friend. Potty training? I think I need to get my little guy with the program! Those are so sweet! I wish I had the patience to decorate cookies this way. So excited to have Natalie's recipe! It is SO good!! Thanks for sharing and your treats at the shower were amazing! How I have misses reading and blogging! Much to catch up on!! omg! yummmy and so cute! How adorable! Your friend must be sooo excited about having a little girl. I think you did a stellar job with the decorating!